Delaney Bend ’19 spent a Wednesday afternoon packaging 190 prints into sleeves. The artwork belongs to several artists, including Larry M., an artist who is homeless she’s been working with all semester through a program called Art Space. A collaboration between the Tampa Museum of Art, Hyde Park United Methodist Church/The Portico and the UT art therapy program, Art Space has helped several homeless artists find and release their inner creatives through a weekly gathering, sometimes at the museum and sometimes at The Portico, a café and meeting space in downtown Tampa dedicated to supporting homeless initiatives. 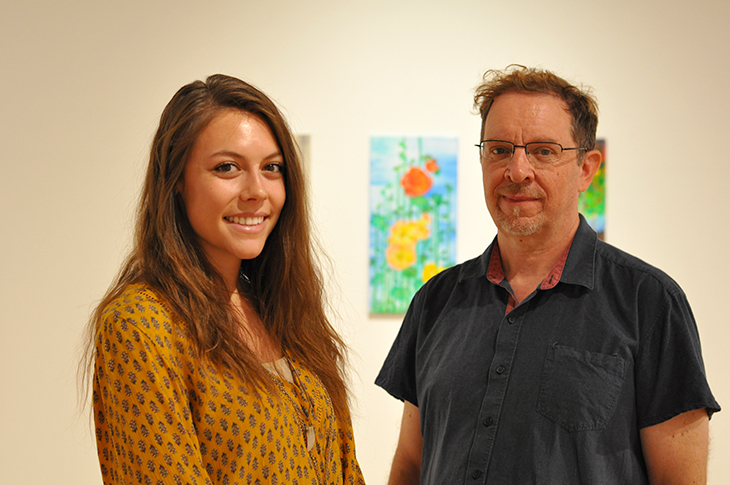 Delaney Bend ’19 has been working with her professor, Joe Scarce, a board-certified art therapist and instructor of art therapy at UT, in a collaborative program between the Tampa Museum of Art, Hyde Park United Methodist Church/The Portico and the UT art therapy program. Art Space provides the art supplies, and UT art therapy students help facilitate and guide the creative process. In the past, they’ve worked with the PACE Center for Girls. Since August 2017 though, they’ve been working with the homeless community. 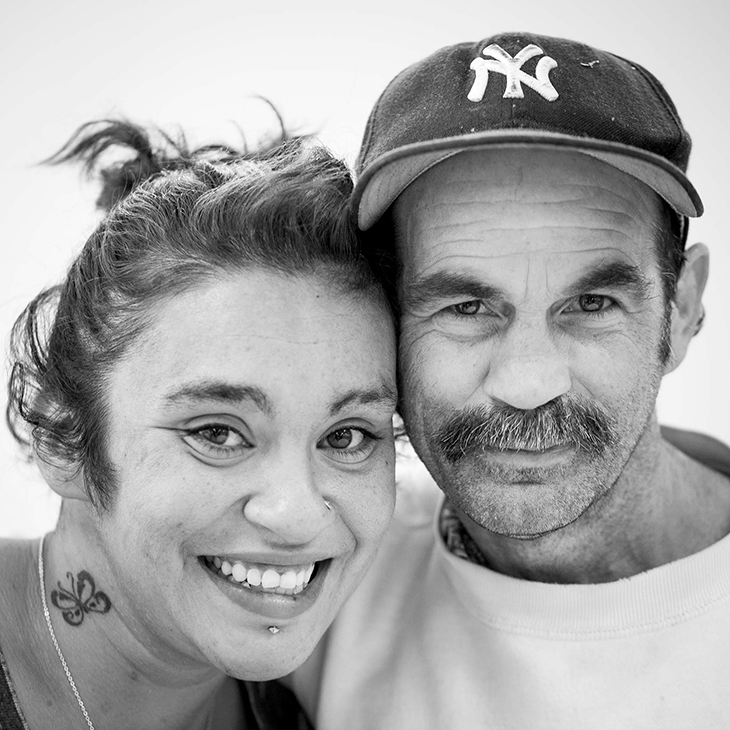 Now through Nov. 4, UT’s Scarfone/Hartley Gallery is hosting Fissures and Cracks, an exhibition of visual works by the homeless of Tampa Bay. The exhibition will also feature The Faces of a Million Meals, a photography portrait series by Tim Kennedy, UT professor of communication, originally created for Trinity Café. Art therapy is a vehicle for communication that uses art for its medium. From veterans with PTSD to children with autism, art tools and symbolism can be used to discover what may be going on internally with someone. Now through Nov. 4, UT’s Scarfone/Hartley Gallery is hosting Fissures and Cracks, an exhibition of visual works by the homeless of Tampa Bay, including the above, painted by Larry M.
Joe Scarce, a board-certified art therapist and instructor of art therapy at UT, said he initially opened up the opportunity to students from his Art Therapy Applications course, which provides them with hands-on opportunities to make art with a variety of populations. In this instance, his students were helping the homeless participants tell their stories through art. Scarce wanted to make sure his students were prepared, so he invited staff from Metropolitan Ministries, which helps poor and homeless families in Tampa Bay, to help students better understand the ins and outs of trauma, substance abuse and issues impacting the homeless community. 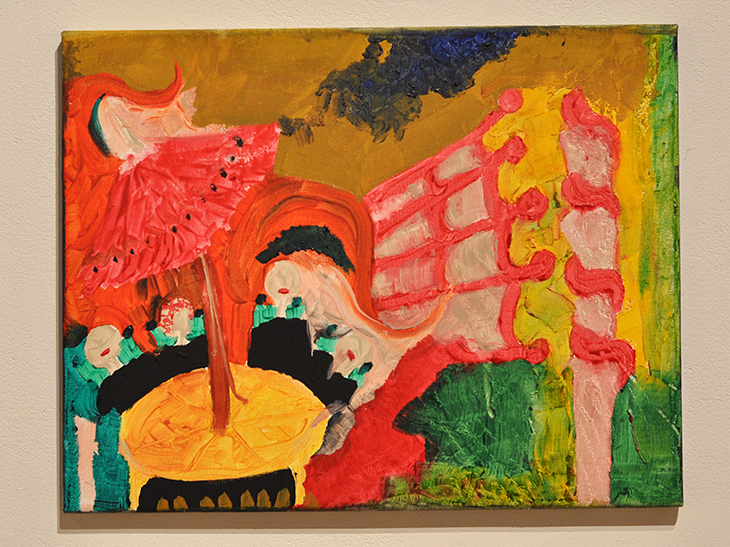 The UT students worked one-one-one with the artists and even lead a tour through the Tampa Museum of Art to examine different pieces, after which they were able to create their own pieces. Megan McGraw '19, an art therapy major from Branford, FL, said it really touched her to be experiencing the museum together. 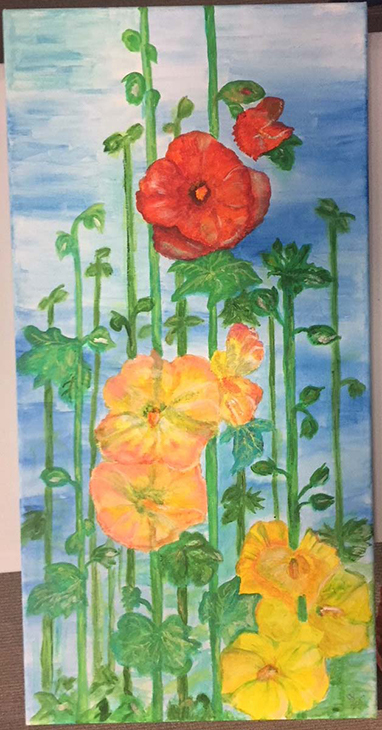 "I choose art therapy because I understand that regardless of it being physical, psychological or emotional, solving issues through artistic expression allows us to see things that words fail to accurately describe," McGraw said. Jocelyn Boigenzahn, director of the Scarfone/Hartley Gallery, was able to secure funding through a partnership with Las Damas de Arte foundation, a Community Arts Impact Grant from the Arts Council of Hillsborough County and the Hillsborough Board of County Commissioners, as well as the Friends of the Gallery. Funds have helped cover the cost of making prints out of the homeless artists’ work, which the artists will be selling, as well as providing a stipend for them. The exhibition will also feature The Faces of a Million Meals, a photography portrait series by Tim Kennedy, UT professor of communication, originally created for Trinity Café. On Friday, Oct. 26, from 6–8 p.m. there will be a panel discussion at the gallery on homelessness in Tampa Bay, the Art Space program, as well as the various resources and programs area organizations are implementing to help with this societal issue. Panelists include representatives from the UT PEACE Volunteer Center; Vicki Walker, minister of missions and outreach from Hyde Park United Methodist Church/The Portico; Scarce; and Mandy Cloninger, executive director of Trinity Café. Scare will be presenting his work with Art Space at the American Art Therapy Association conference in Miami next weekend and hopes to continue working and developing the relationship between UT and the other community participants. The Art Space program provides opportunities for homeless individuals to explore the arts at the Tampa Museum of Art, then provides them with art supplies to create their own visual works with the assistance of UT art therapy students at The Portico in downtown Tampa. The above was painted by the artist Janet. For his UT students, his hope is for their awareness of the needs of the community in which they live, as well as impactful experiences to reaffirm their career paths. For Bend, working with the program has reinforced her desire to help people heal through art. “I’ve always wanted to help and touch the lives of people, but now I want to do this by opening up their creative sides,” said Bend.